Surveys are designed to collect information for the research purpose. The number of respondents is set in the overlap, and the requirements for them are set with filters. Let's say you want to know what Russian-speaking population has for breakfast. To do this, create a single task on a page and in the pool: the performer sees several questions with answer options. Click the + Create project button and choose Blank. We recommend including the word "survey" and the survey topic in the Project name. Briefly explain in the Description what the performer has to do in the task. Performers will see them in the task list. For a survey, instructions are not required. Place the recommendations for filling out the survey in the tasks interface. Note. Don't leave your contact information. This is contrary to the Customer Service Agreement. Input data field — The theme string to upload a survey. It is not used in the interface and can contain any text. The required string drink to record the performer's response to the question "What do you drink for breakfast (besides water)?". This means that the performer will see three questions with answer options. Click the Preview button to view the task. Note. The preview shows four tasks with standard data. In the survey, there is one task per page. You can set up the display of one task per page later. Set the price per task page (for instance, $0.01). 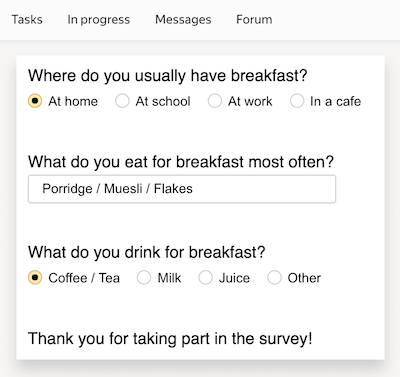 In a survey, a task page must contain one task. Specify the Time for task completion, for example, 600 seconds. Set an Overlap, which is the number of performers to complete the same task. At first, set a small number, for example, 100. If you see that this is not enough for sampling, increase the overlap. Run the task both in the web version and in mobile apps to speed up the task completion. To do this, add the Client filter. Add input data in it. The header of the input data column contains the word INPUT. 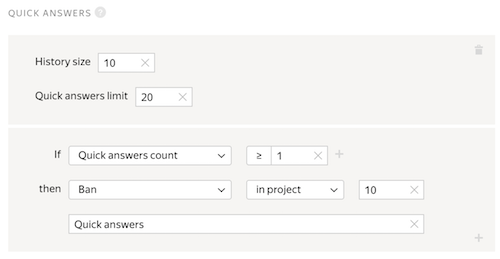 To upload a task, add any text to the INPUT column. The string from the input data field isn't used in the interface. Leave the other columns empty. Load tasks by choosing Set manually and setting 1 task per page. This means that a user who completes a task page in less than 20 seconds will be blocked for ten days and won't be able to complete the project tasks. This means that if a performer is blocked for quick answers and the responses aren't taken into account, this task is resent to another user for completion. When the pool is completed, launch the results aggregation. To do this, click → Responses aggregation next to the Download results button. Track the aggregation progress on the Operations page. When the process is completed, click Download. If the performers' responses aren't enough for analysis, increase the Overlap to receive more responses. How do I increase overlap? Stop the pool by clicking . In the upper right corner, click Edit. Change the value in the Overlap block. Click the Save button and start the pool.